Stuck with extra rotis and don’t know what to do? Or tired of eating sabzi roti for a packed lunch? Here is an easy no fuss way to make Kathi rolls at home. I have deliberatedly omitted adding raw onions as a courtesy to a working lunch! but feel free to add them in the layers if you wish to! Heat the oil and add the onions, fry them till they are translucent. Add the tomatoes and sauté for a few minutes till they begin to lose shape. Add the red chilli, salt, amchur powder, garam masala and coriander powder and cook for 1-2 minutes. Add the cubed paneer and cook covered for 4-5 minutes. Make sure the paneer is not overcooked and is nice and fluffy. Add a few teaspoons of water if you would like, but it should not have a runny gravy. Cool the filling mixture. Add the lemon juice and mix. Spread out the chapathis on a work surface. 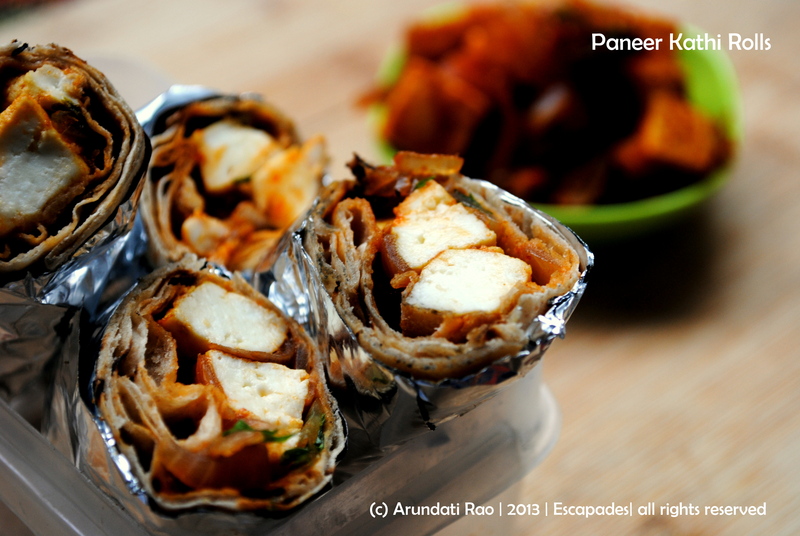 Spoon over 2 tablespoons or more if needed of the paneer filling onto the chapathis and roll into a kathi roll. Fix it with a tootpick. Lay out on a paper towel in the lunch box. Alternatively, wrap each kathi roll in foil and pack.